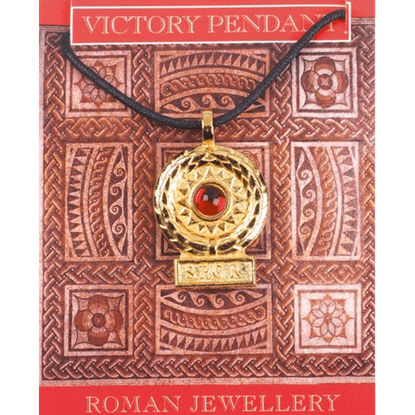 Whether you are dressing up as a decadent Roman citizen, bold gladiator, powerful Greek orator, or disciplined Hellenistic soldier, you can find excellent Greek and Roman accessories for your look here. 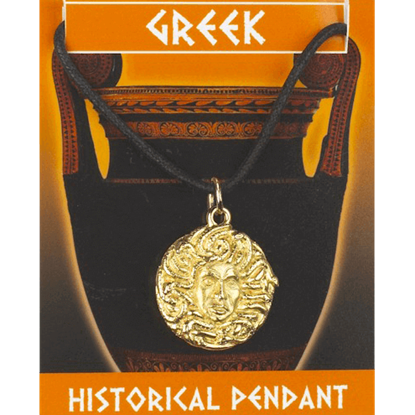 Our Greek and Roman necklaces and pendants come in a variety of styles, many of them featuring popular motifs and symbols from Greek and Roman mythology and culture, such as owls, serpents, coins, Medusa, and more. 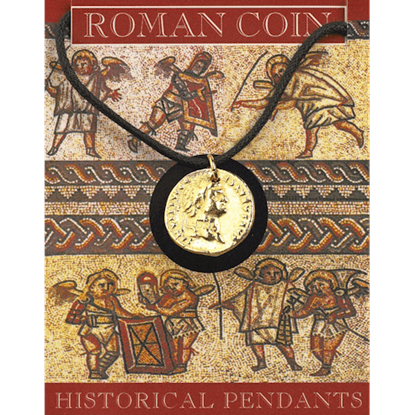 Crafted from fine materials like pewter and gold, many of these historical Greek and Roman pendants show off either a polished or antiqued finish to give you options. Other pieces are crafted with beads, enamel, and faux gems for a colorful look. These Roman and Grecian necklaces and pendants make great finishing touches when paired with other pieces of our Greek and Roman jewelry, so be sure to take a moment to browse for accessories for your next toga party! 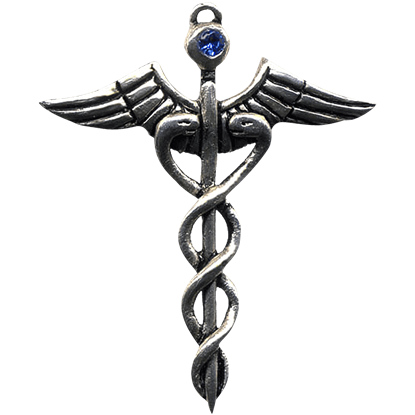 Based on the staff of classic god Hermes, the Caduceus has since become a symbol for healing. Featuring two snakes intertwined around a winged staff, wear this elegant charm to promote wellbeing in your own life. 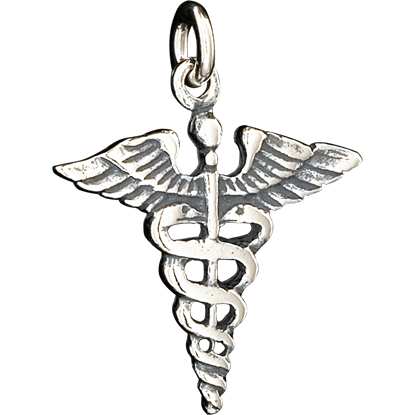 The Caduceus Pendant is based on the staff carried by Hermes in Greek mythology. 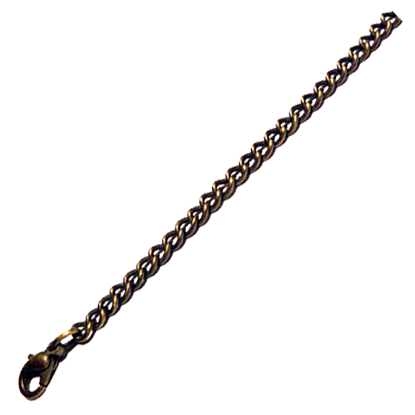 This ancient symbol is ideal for anyone familiar with the role this staff plays in the modern world who wants to freshen up their ensemble a bit. 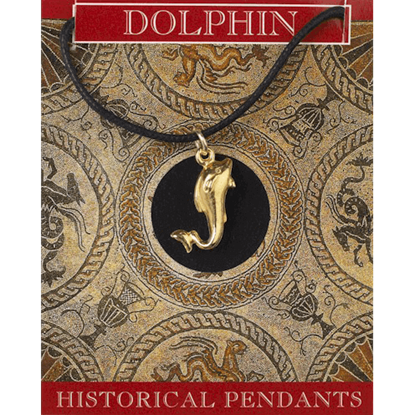 In Roman times, dolphins and other sea creatures were very popular, and were often depicted on jewelry like this Gold Plated Dolphin Necklace. This accessory is depicted on an informational card that features historical facts on the back. This reproduction 22ct gold plated aureus coin is made from lead-free pewter and is supplied on a waxed cord. The coin has a bust of the Roman Emperor Domitian on one side and a cornucopia (horn of plenty) on the other. 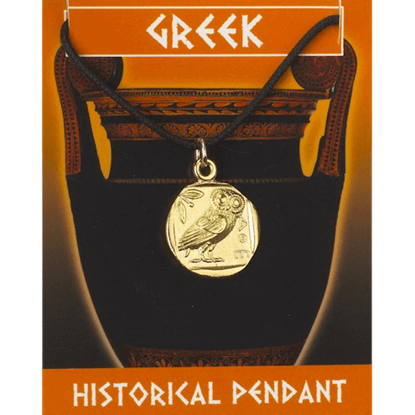 This is a gold plated pewter reproduction of a 22ct gold plated Greek owl coin supplied on a necklace. The information on the reverse of the card describes how Greek mythology appears on Greek jewelry designs and coinage. 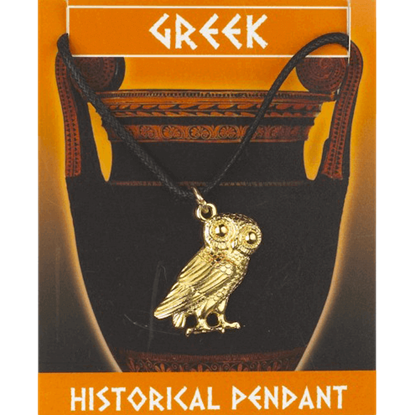 This Greek owl is made from lead-free pewter, plated in 22ct gold and is supplied on a waxed cord. The information card is full color on the front and has historical information on the reverse. It makes for a great personal accessory. This Medusa Pendant is made from lead-free pewter and is 22ct gold plated and is supplied on a waxed cord. The information card is full color on the front and has historical information on the reverse. 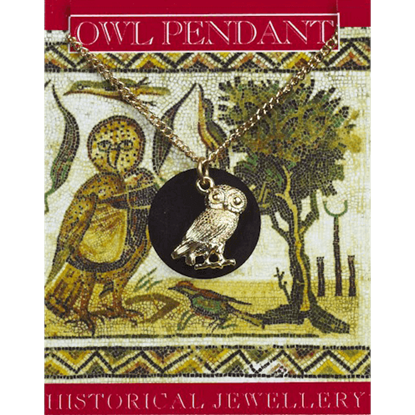 Roman jewelry typically depicted important figures or animals, and this Gold Plated Roman Owl Necklace depicts a watchful owl. The pendant comes attached to an information card that details the owls relationship to Minerva. The initials SPQR (Senatus Populusque Romanus), meaning The Senate and people of Rome, were put on buildings, army standards, and coins. It was the mark of the Roman Empire that can still be seen today on buildings in Rome. Since ancient times, goddesses have been represented as symbols of protection. 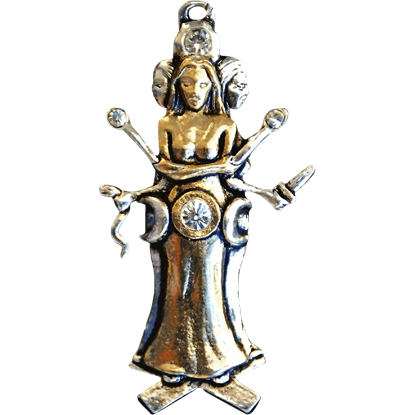 The Hecate Goddess Necklacedepicts the powerful Greek guardian of the crossroads in her signature triplicate form, showing her own mysterious might.